In film-making, ‘mise-en-scẻne’ is used to mean ‘placing on stage’ or ‘telling the story’. This is not only the various design elements of a scene, but literally everything that constitutes one frame. Really everything from composition to form; colour to proximity of characters. It is not only the dialogue between characters, but a range of aspects – 15 fundamental principles – working together to form one frame. In a film the background, connections and the gentle ‘flowing-into-each-other’ of components are required to make the scene whole, meaningful. Similarly, stages in a lesson cannot stand alone requiring background, connection and a ‘flowing-into-each-other’ to form an effective, well-planned and executed lesson. 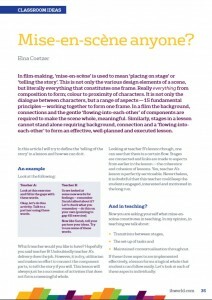 In this article I will try to define the ‘telling of the story’ in a lesson and how we can do it. Look at this exercise and fill in the gaps with these words. Okay, let’s do this activity. Talk to a partner using these words. Now like Sarah, tell your partner your ideas. Try to use some of these words. Which teacher would you like to have? Hopefully you said teacher B! Undoubtedly teacher A’s delivery does the job. However, it is dry, utilitarian and makes no effort to connect the component parts, to tell the story if you will. This lesson will always just be a succession of activities that does not form a meaningful whole. Looking at teacher B’s lesson though, one can see that there is a certain flow. Stages are connected and links are made to aspects from earlier in the lesson – the coherence and cohesion of lessons. Yes, teacher A’s lesson is perfectly serviceable. Nevertheless, it is doubtful that this teacher could keep the students engaged, interested and motivated in the long run. Transitions from one stage to the next can be ‘good, let’s do exercise 3’ or it can be a logical path of signposts indicating the connections, the significance and the useful aspects that students need to consider moving forward. How to do this? Help students to see the connections between the different stages. Remind students of the context throughout your lesson showing them the ‘story’, the connections and the logical order within the lesson. – …it holds my interest and keeps me focussed. I could not have stated it better myself. Set yourself specific goals every week, for example trying not to use ‘teacher’ words so much. Record yourself to see how well you are doing. Initially, script your teacher talk in detail during transitions and task settings. Observe colleagues to see what they do. Ask your students their opinions. And finally, experiment until you find your own unique method. South African Elna Coetzer, who is based in Istanbul, is a freelance teacher trainer and consultant with OUP, the international Training Institute and various other organisations. She has worked as a teacher, a DoS and as an educational consultant and trainer at CUP. She is a CELTA, YL and ICELT trainer, online moderator, teacher training materials writer and editor and has worked in various contexts internationally. Her interests range from teaching YLs and developing motivation to using stories and including more creative activities into lessons.